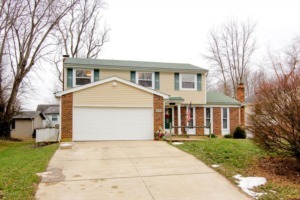 Don't miss this 4 BR and 2 1/2 BA in Oldham County School District! The kitchen has been remodeled with cherry cabinetry, soft-close drawers, GE Profile appliances, including convection oven/microwave combo. Designer lighting, wall mounted flat screen HD TV at the breakfast bar, granite counters, and Brazilian Cherry solid hardwood flooring. A large formal living room and formal dining, half bath, and versatile den round out the first floor. All bathrooms are custom designed and remodeled with tile floors. The Master Bath shower also has custom designed tiled walls and marble shower basin. A full basement, attached two car garage, beautiful deck with retractable awning, fenced backyard, and a basketball court. Click to schedule your showing!